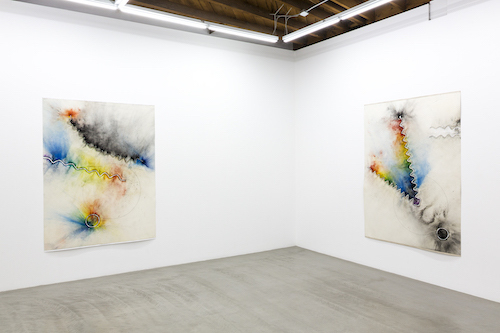 “View of Charles Ross: Solar Burns, Prisms and Explosion Drawings,” 2017. From left: Spooky Action at a Distance IV, Spooky Action at a Distance III, both 2016. On the way to see Charles Ross’s first solo show in Los Angeles, I drove past one of the city’s many parks. There were shirtless men running, families strolling, and sunbathers lying on the grass—a picnic or a joint (or both!) near at hand. This scene provided a strangely apropos lead-in to the artist’s body of work, which, while abjuring any recreational activities under the sun, makes much of the science of sunlight. Almost half the works that make up this exhibition are from Ross’s long-running series “Solar Burns,” 1971–. These drawings—Ross has referred to them as “portraits of light”—index the changing conditions of sunlight via a magnifying device that burns a path onto prepared wooden panels. While the burns mark time (137 Burns by Minutes Through Seconds to Null, 2015) and cosmological events (HSSB [Human Size Solar Burn] 6/21/16, Summer Solstice, 2016), Ross’s “Explosion Drawings,” 1980–, depict the schematic operations of varying sources of light, akin to something you might see in a physics textbook. But these works, completed by using dynamite, fuses, and a rainbow of colored pigments, appear more exuberant than didactic. Spooky Action at a Distance III, 2016, represents luminescent waves entering and being refracted through a broad circle. A smaller, darker, eclipse-like form in the bottom-right corner of the drawing counterbalances the otherwise colorful work, providing a much-needed visual corrective to the sun worshippers at play only blocks away.